bell at the bottom”. Well, now we need to get updated some 8 weeks later after this massive Gold rally which has put Gold in a technically overbought condition. Recently at my forecast service I discussed 1415 as a key line in the sand for the GOLD rally, to see if it could take that Fibonacci level out off the 1179 spot lows. It did briefly, hitting 1434 which is where roughly the A wave equals the C wave from the 1179 lows. Anytime you see what looks like a clear cut A B C pattern after a big decline, a few warning bells should go off for a short to intermediate term top. The warning signals we see are numerous, so they are worth noting: 1. The rally to the 34 week moving average line abruptly halted just $3 short of it and reversed hard to the downside. this last stretch of Gold Trading over 1415 was probably Syrian concerned based mostly. http://www.themarkettrendforecast.com/wp-content/uploads/2013/08/TMTF-word-header.jpg 0 0 admin http://www.themarkettrendforecast.com/wp-content/uploads/2013/08/TMTF-word-header.jpg admin2013-09-03 10:36:482014-06-24 10:57:04Gold topping out for a bit? Traditionally, Gold tends to meander or be weak in April anyways on a seasonal basis. This sets Gold up to rally in May into July with another soft patch, followed by a fall rally. However, our technical analysis is predicated on our Elliott Wave analysis, which says this entire 20 month correction is a “Double Three” correction pattern. Essentially its two ABC patterns with an “X” Wave rally in the middle to really confuse everyone. The X wave took Gold to 1800 last fall before dumping all the Bulls off and eventually working its way down to the 1540’s levels we see today. This last leg down is a 5 wave decline and you know you’re at the bottom of wave 5 when everyone throws in the towel, the Gold stocks trade at multi year lows and relative valuation extremes. We also have insiders buying 7 to 1 over sellers according to Ink Research in the Gold stock sector. Stocks are valued at $923 per ounce equivalent even though Gold is trading north of $1,500 per ounce still. 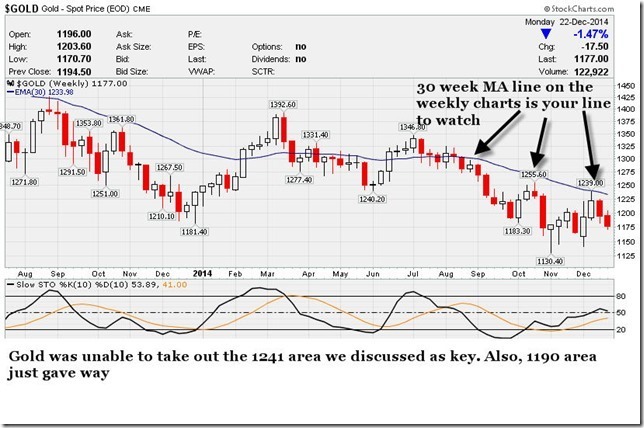 See the Gold Elliott Wave analysis chart we sent to our paying subscribers a few days ago to forewarn of one more leg down. The next rally should be a doozy and have very few people on board. We would simply caution that a drop below $1523 spot pricing could lead to a blast down to the 1440-1460 areas, but its unlikely in our current views.